Climate is the average weather in a location over a long period of time. As some climate scientists like to say, "Climate is what you expect, weather is what you get." Climate is not only the measure of average conditions but also the characteristic range of variability from those conditions. Therefore, climate change refers to shifts in the average state of the climate and in its variability. For example, climate change may be evident in changes to expected temperature or precipitation, but also to the occurrence of variable weather events such as heat waves, floods, or drought. Changes in the frequency and severity of climate variability (weather events) often cause more damage and are more difficult to adapt to than gradual change. Globally, changes in climate are already impacting the region through higher average temperatures, altered precipitation patterns, and more extreme weather events. In forests, changes in temperature and precipitation can influence the occurrence and intensity of disturbances such as wildfire, introduced species, and pathogen (disease) outbreaks. In cities and towns, these changes can also influence the occurrence and intensity of severe weather events, such as flooding and drought, placing our roads, homes, and other infrastructure at risk. Forests will play a crucial role in adapting to a changing climate because they will continue to serve as natural reservoirs for high-quality water and as refuges for biodiversity. Therefore, it is important to have healthy and resilient forests that rebound after disturbance. By looking at historical climate data and prevalent climate trends, we can assess what changes Western North Carolina might expect, and begin to understand how to prepare for possible changes. Climate models are extremely important tools for simulating and understanding climate, and they can provide credible projections of future climate change. Climate model projections are not predictions, but rather scenarios of how the climate might change based on observed patterns. Multiple models are often used to illustrate a range of possibilities. Every model has an inherent degree of uncertainty, because its projections provide only a general picture of what to expect. 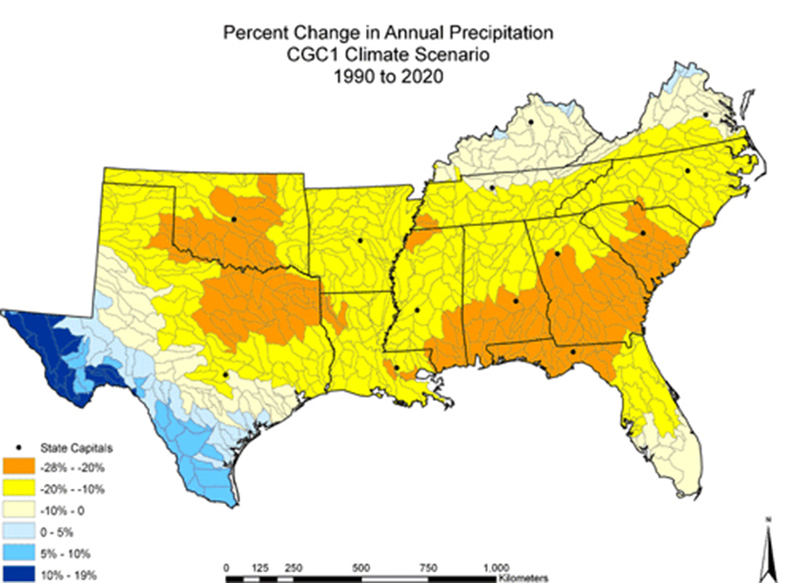 For a region such as Western North Carolina, changes in climate will be highly variable due to the range of microclimates; climate models do not necessarily account for the variability. This uncertainty shows the importance of a regional approach to understanding the effects of changing conditions. With climate projections, uncertainty does not necessarily imply that change is unknown, but rather that future conditions involve variability. Hadley Model. The computer model developed by the Met Office Hadley Centre for Climate Change represents a "warm and wet" future scenario. 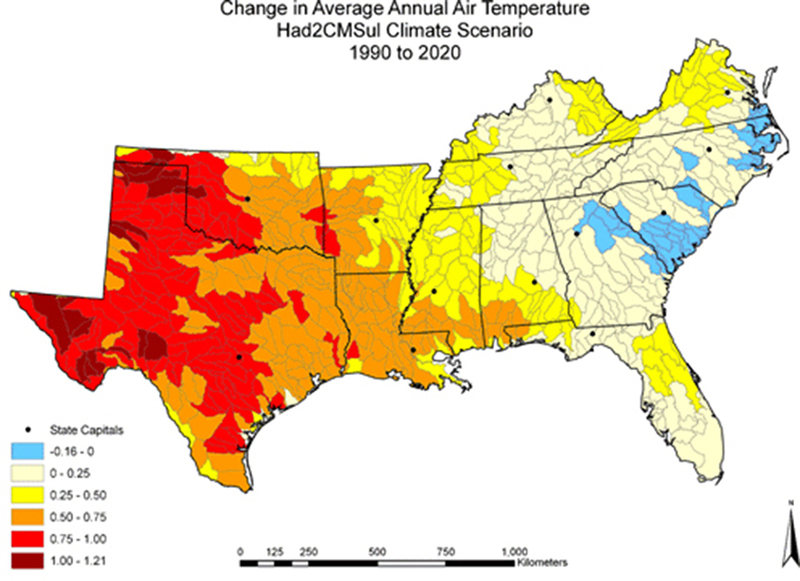 In Western North Carolina, the Hadley model shows moderately warmer air temperature and increased average precipitation by 2020. Water stress is defined by the availability of water. Water stress impacts the land primarily by its effect on soil moisture. Soil moisture is important for biological processes and forest health, and soil moisture levels are determined both by temperature and precipitation. 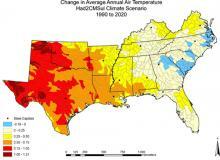 For Western North Carolina, soil moisture levels change due to the range of microclimates. 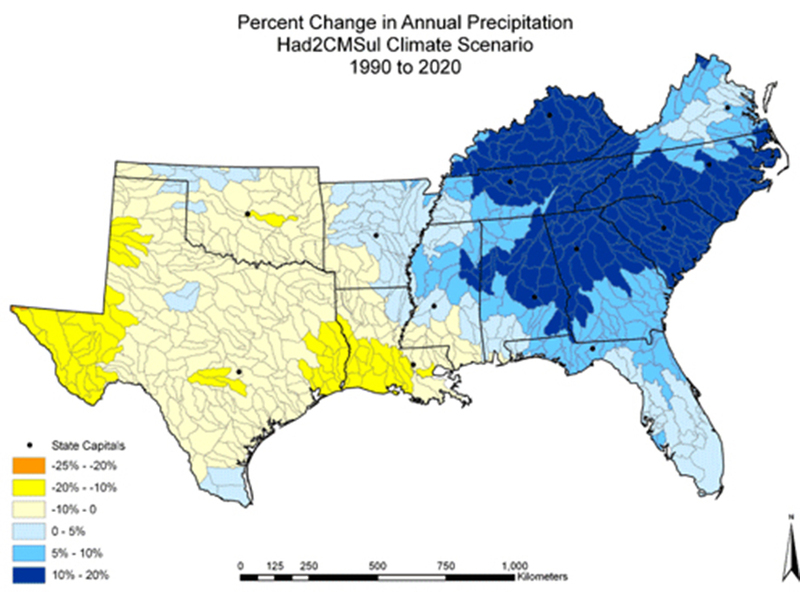 The increases in precipitation for the region with the Hadley model would generally increase soil moisture and, as a result, decrease water stress. However, while increasing precipitation alone would increase soil moisture, higher temperatures in some areas, resulting in greater evaporation, would offset the additional moisture. Some areas in Western North Carolina might experience more water stress conditions than others despite increased precipitation. Canadian Model. The climate change model developed by the Canadian Centre for Climate Modelling and Analysis represents a "hot and dry" future scenario. For Western North Carolina, the Canadian model shows much higher average air temperature and decreased average precipitation. Water stress and soil moisture levels are determined by temperature and precipitation. Much of Western North Carolina would experience great declines in soil moisture. The Canadian model depicts increases in water stress and other effects, such as increased drought. Because the forests of Western North Carolina may experience great change, how we use forest resources may also change. 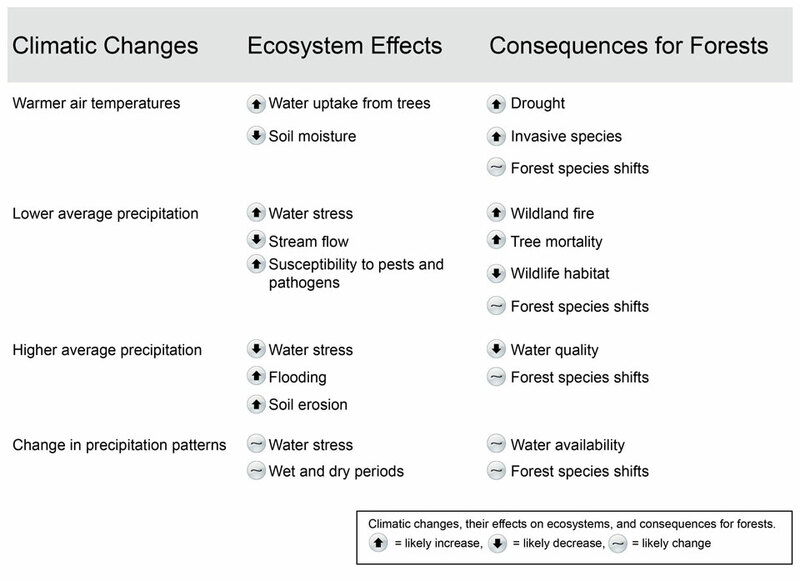 The ability to manage for disturbances affected by climate change varies greatly; therefore, strategies for coping with impacts from climate change in forests will vary regionally and by management area. How do forest disturbances interact with climate change? How should the forests be monitored to inform decisions? What information is needed to understand the response of a forest to changing conditions? What changes could forest managers make to reduce negative impacts of climate change? Impacts to forest sustainability. Forests are acclimated to the climate zones in which they are found. Warming temperatures due to climate change will shift suitable conditions. With changing temperatures and precipitation, dominating forest types are likely to change. Warmer temperatures will shift suitable habitat for forests higher in altitude. Drought. Decreased precipitation or increased temperature will lead to increased drought. Drought occurs in all forest types, and the general response of forests to drought is to reduce vegetation growth. Under severe drought, forests reduce vegetation growth and plants die. When drought occurs over multiple growing seasons, increased susceptibility to insects or pathogens is possible. Fire. The frequency, size, and intensity of fires depend on climate as well as forest structure and composition. While fire is a natural occurrence in many forest types, increased frequency and severity of natural fires would greatly impact the forest. Decreased precipitation from climate change would increase fire risk in areas that become drier, and these changes could compound existing fire risks. While fire may be detrimental to some forest types, the vulnerability of the forest will depend on its resiliency and ability to adapt. Insect Infestations. Changes in temperature and precipitation also affect insect and pathogen survival, reproduction, and distribution. These changes can have a range of effects on forests and lead to increased tree mortality rates. The loss of certain tree species to disease or infestation can significantly reduce biodiversity and wildlife habitat. Dale, Virginia H., Linda A. Joyce, Steve McNulty, Ronald P. Neilson, Matthew P. Ayres, Michael D. Flannigan, Paul J. Hanson, Lloyd C. Irland, Airel E. Lugo, Chris J. Peterson, Daniel Simberloff, Frederick J. Swanson, Brian J. Stocks, and B. Michael Wotton, "Climate Change and Forest Disturbances," BioScience 51, no. 9 (2001): 723–734. 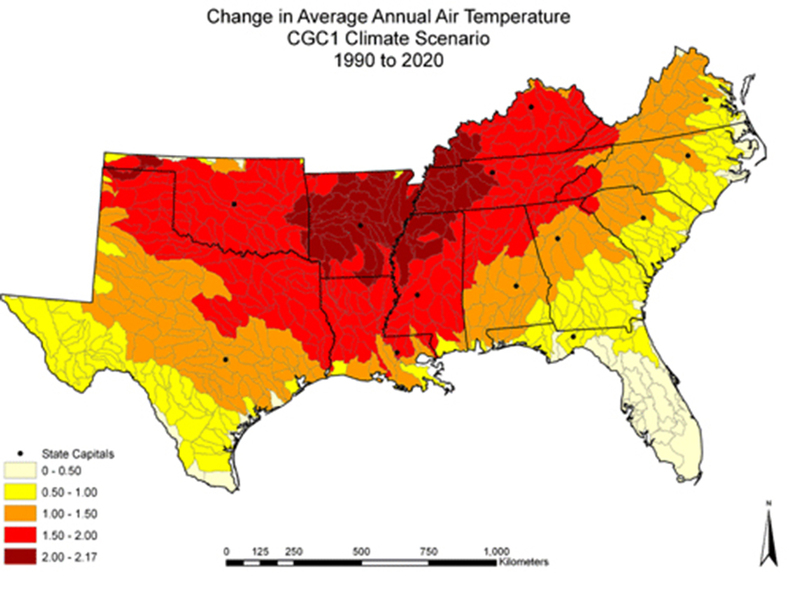 State Climate Office of North Carolina, Climate Division Data, http://www.nc-climate.ncsu.edu/climate/climdiv.php#thumb. Sun, Ge, Steven G. McNulty, Jennifer A. Moore Myers, and Erika C. Cohen, "Impacts of multiple stresses on water demand and supply across the southeastern United States," Journal of the American Water Resources Association 44, no. 6 (2008): 1441–1457. 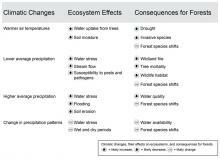 U.S. Department of Agriculture, Forest Service, "In Brief: Climate Change and Water — Perspectives From the Forest Service," FS-908, June 2008. U.S. Environmental Protection Agency, Office of Policy (2111), "Climate Change and North Carolina," 236-F-98-007q, September 1998. U.S. National Atlas, Raw data download, http://www.nationalatlas.gov/atlasftp.html.